This Jolly ole Elf is Santa John from Waldorf Maryland. 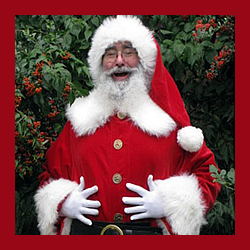 Santa John brings a special message of HOPE and promises storyteller magic that will leave your family and little ones enchanted for years to come. Along with candy canes and gifts, Santa John has ready en entire history of Santa and Saint Nicholas. Just call today and make sure Santa John is a part of your holiday tradition.